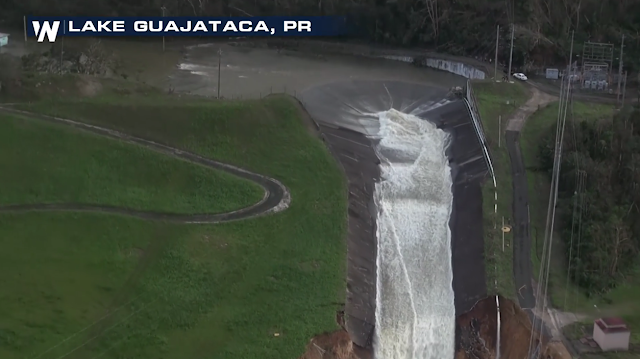 The Big Wobble: A new horror hits Puerto Rico as Guajataca Dam is failing causing life-threatening situation for 70,000 people with "imminent failure" expected. A new horror hits Puerto Rico as Guajataca Dam is failing causing life-threatening situation for 70,000 people with "imminent failure" expected. A new horror has hit Puerto Rico after the devastation of Hurricane Maria, the Guajataca Dam is failing and is described by The National Weather Service as a life-threatening situation for 70,000 people with "imminent failure" expected. At least 13 people have died since Maria ripped through Puerto Rico, knocking out power to the whole island. Operators of the Guajataca Dam said the structure, at the northern end of Lake Guajataca in northwest Puerto Rico, began to show signs of failing at 14:10 local time (18:10 GMT). It sparked a flash flood emergency for Isabela and Quebradillas municipalities, the NWS said in a series of tweets. The agency urged residents in the area to "move to higher ground now" in an alert posted on its website. Many who live near the dam are being evacuated by buses, according to the BBC. Details remained sketchy about the evacuation with communications hampered after the storm. The 345-yard (316-meter) dam holds back a manmade lake covering about 2 square miles and was built decades ago, U.S. government records show. "This is an extremely dangerous and life-threatening situation. Do not attempt to travel unless you are fleeing an area subject to flooding or under an evacuation order," an alert on the NWS website said.